Herbes de Provence is a tour of delicate flavors. This classic blend from the South of France for country cooking, also known as Provençal herbs, is floral, flavorful, fruity & fresh. There are as many mixtures of Herbes de Provence as there are ways to use it. Ours is a purist mixture, with a very unique and delicious flavor from a special combination of hand-blended (mixed together, but not ground) thyme, basil, summer savory, oregano, and rosemary, with a hint of marjoram, that represents the bounty and fragrance of the region. And it makes everything taste heavenly. Herbes de Provence is used to add the flavor of the French countryside with ease and simplicity instead of using individual herbs. The most common types of foods in which Herbes de Provence is used include grilled meats and vegetables, roasted chicken, baked fish as well as in soups, gravies and stews. → Use this charming blend/mélange to sprinkle over fresh goat cheese drizzled with Saratoga extra-virgin olive oil, to rub densely over a leg of lamb or pork chops, and to season oven-roasted vegetables of all kinds. → Herbes de Provence makes a terrific flavorful addition to omelettes, roasted chicken or turkey, all kind of meats: beef, veal, pork, lamb, & for all kind of fish or sea-food, marinades, sauces, salads, soups, fried vegetables and vegetable stews as well. → Apply before grilling or baking to kabobs, and white fish. → Add it to a vinaigrette and drizzle it over a fresh green salad to give them a holiday fragrance. → Blend it with yogurt and garlic for a flavorful lamb marinade. Add a dash to the filling of a savory tart or quiche, or pizza as well. → Combining this lovely herb blend with a top-grade olive oil makes a lovely dipping sauce for fresh bread, and it will always complement your meal well when your entrée also contains Herbes de Provence. → Our special blend of aromatic herbs may also be used in olive oil when cooking all kind of vegetables. Use this blend with any Italian recipe. In fact, use it anytime you want a taste of sunny French Provence. ❖ Ingredients: thyme, basil, summer savory, oregano, rosemary & marjoram. Did you know… Marjoram (an herb in the oregano family) was referred to as the “Joy of the Mountains” by the Greeks and celebrated throughout the Mediterranean for its flavor, fragrance and medicinal values. If wild marjoram grew on a grave, it was thought to bring happiness to the departed. Both the Greeks and Romans adorned young couples with a marjoram crown and in ancient Egypt, the herb was offered upon altars to the Egyptian deities. Dietary Restrictions: Salt free, Gluten-Free, No MSG, Non-Dairy, Non-GMO, Kosher, Zero additives. Easy to store, minimal foot print. This robust blend is a blank canvas, just screaming for flavor fusion. Greek Spice, or Grecque, is a gentle and tasty, highly aromatic, seasoning blend for Mediterranean luvin’ flavor. It is versatile and easy to use. Greek need only be paired with olive oil. Traditional Greek character —smoky, slightly sweet and delicious, full flavored— it offers the perfect balance of minty thyme and the sweet yet peppery taste of basil with background notes of nutty nutmeg, aromatic rosemary and garlic. Greek seasoning adds sweetness and depth to savory dishes. The distinctive scent gets much better when you cook with it. It is an excellent choice for any Mediterranean cuisine, including seafood, salads and gyros. Perfect when roasting vegetables of every kind. Drizzle your favorite olive oil over vegetables before sprinkling them with Greek Seasoning. Adds a light, savory flavor to chicken, fish, lamb, and soups. Mix with any fruity Saratoga olive oil for a simple, delicious poultry marinade or to make a flavorful sauce for spaghetti, veal parmesan, or noodles. Or rub some between your hands and sprinkle it on a store-bought pizza to improve its taste. Good sprinkled on pork chops and steaks before serving. It’s a tasty blend for homemade shish kebabs or gyros sauce, and wonderful on grilled vegetables. Greek Seasoning also makes a flavorful topping on dips like hummus. For a classic gyros sauce, mix 2-3 teaspoons with 1 cup sour cream or plain greek yogurt, 2 tablespoons diced cucumber, and 1 tablespoon minced onion. For a nice shish-kebab marinade for lamb, beef, pork or chicken, mix 2 teaspoons Greek seasoning with lukewarm water to rehydrate, then mix with 1 tablespoon olive oil and 1 tablespoon lemon juice. Cut 1 pound of meat into cubes, cover with marinade, and refrigerate overnight. Skewer, then grill until brown. As a marinade, try emulsifying red wine with olive oil, add fresh lemon juice and 1 or 2 tsp. of Greek and marinate in the refrigerator for three hours before cooking. A hand mixed classic combination of sweet Oregano, Parsley, Rosemary, dehydrated Garlic powder, fragrant Basil, delicate Thyme, fresh ground Nutmeg, bold Tellicherry Black Pepper, and Himalayan Pink crystal salt. We crush the Rosemary before mixing so you won't experience any prickly needles. ★ Good up to 1 year after opening, but even better if used within 6 months. Dietary Restrictions: Gluten-Free, No MSG, Non-Dairy, Non-GMO, zero additives. Oregano imported from Greece. Basil from Egypt. Rosemary and Thyme from Spain. Tellicherry Black Pepper imported from India. For the kid in all of us, have a look at old Jacques Pépin videos on youtube (below) to learn about “real,” old school, egg-cellent and delicious French Omelettes. And, after that, if you’re feeling adventurous try to make one (from start to finish, an omelet should take you no more than a minute or two). Add a teaspoon of Greek Seasoning and a teaspoon of a fruity Saratoga Olive Oil before whisking the eggs — and when you're whisking the eggs, make sure you're doing it hard enough to get some air into them. They should be frothy, not just combined. It really makes great omelettes. We know there are about as many omelette recipes under the sun as there are ingredients to fold into them. There's no limit to the number of fillings you can use with this basic omelet recipe. So, we encourage you to explore more about delicious omelettes. A rub should coat the surface of the meat so work a rub evenly into to the meat to get the flavor inside as much as possible. If you are applying a rub to poultry try and get it in under the skin so it can better absorb the flavor. Lightly scoring meat, poultry, and fish will help the rub flavors penetrate further. Apply your rub at least one hour before you plan to grill. Large roasts, whole poultry, or briskets should be rubbed down the night before or at least several hours before you plan to grill. This allows the seasonings to mix with the natural juices of the meat and add as much flavor as possible. Why we love this blend? Kickin' Cajun delivers the smokey warmth that typifies the ideal N’awlins Cajun taste. One mouthful, and you’ll think you’re on Bourbon Street in N’awlins! “Cajun” refers to the rustic cuisine of rural Louisiana that was developed by displaced French Canadians during their expulsion from British rule in the 1750's. Cajun food is characterized by simple French & Mediterranean style, one pot style dishes. This delicious blend has a bit of mild spiciness with just a bit of temperate heat that delights the palate, balanced with the aromatics of fragrant coriander, onion and garlic and the tastes of hearty oregano, sweet paprika and floral thyme. This seasoning is so tasty and versatile that whether you do a lot of Cajun style cooking —gumbo or jambalaya— or not, you'll find many ways to enjoy it. Use Kickin' Cajun as a dry rub (or moisten with olive oil) on fish, chicken, prawns or steaks. Adds a spicy zip to fresh crawfish, broiled shrimp, pork, and burgers. Add to soups, vegetable, lentils or sprinkle over baked potatoes, gratins or grilled tomatoes. You can use Kickin' Cajun as a blackening or all-purpose seasoning: Use about 1 tsp. per pound of meat. In addition, use as a sprinkle to liven up vegetables, rice and bean dishes, or salads. We also find it is great on baked sweet potato fries, or scrambled into eggs for a spicy breakfast. Mix it into a marinade, or rub it right on dry or with a little extra virgin olive oil, and it’s ready to go! It’s an easy way to spice up – literally – an ordinary vegetable or side dish! Make spiced cashews to serve with drinks. In a bowl mix one pound raw unsalted cashews, 1 egg white, half a cup sugar and 3 tablespoons Kickin' Cajun mix. Mix all together and then pour onto a baking tray. Bake in medium over until brown. Cool and then separate mixture — add a little sea salt to taste, (great also with almonds!). We’ve combined a link with the old world herbs & spices of Greek oregano, delicate thyme and cumin with the new world spices of Hungarian paprika, fragrant coriander, cayenne pepper, bold Tellicherry black pepper, dehydrated organic garlic powder, minced onion, and pristine Himalayan pink crystal sea salt (Gourmet food grade), resulting in a perfectly balanced blend-with-a-kick. 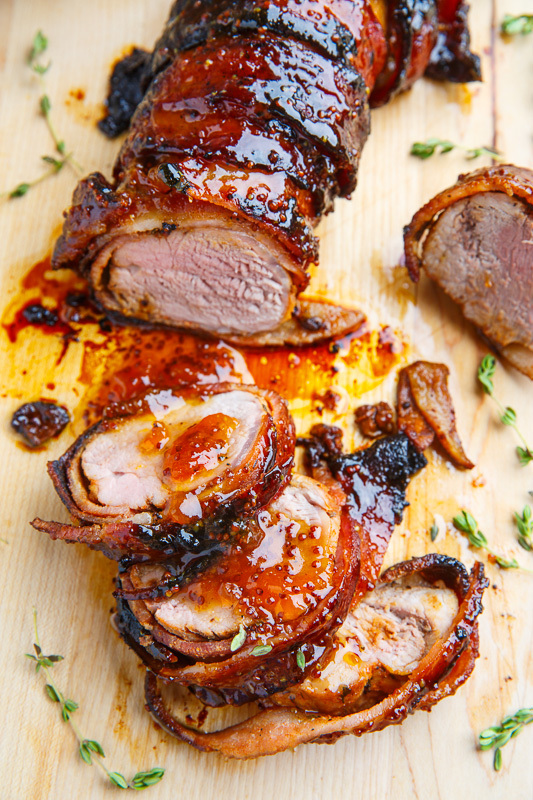 Rub the pork tenderloin with the mixture of the Kickin' Cajun seasoning and brown sugar and wrap it up in the bacon. Heat an oven safe skillet over medium heat, add the bacon wrapped pork tenderloin and cook until it is browned on all sides, about 10-15 minutes. Transfer the pan to a preheated 400°F/200°C oven, roast until the pork reaches 140°F/60°C, about 10-15 minutes, brushing on the mixture of the apricot preserves and mustard near the end before setting aside it to rest, covered, for 5 minutes. Size: There are six options. Dietary Restrictions: Gluten-Free, No MSG, Non-Dairy, Non-GMO, Kosher, Zero additives. Oregano imported from Greece. Rosemary and Thyme from Spain. Nutmeg and Tellicherry Black Pepper imported from Western India and Himalayan Pink sea salt from Punjab region of Pakistan. Organic Garlic from California. One of the great, classic blends —sweet, spicy & lemony— for all taste buds. A perennial favorite with seafood, our Lemon-Pepper Seasoning celebrates the fruits of the ocean with fantastic complementary flavors. It will add wonderful flavor to any meal. From the first taste, with a peppery floral aroma of freshly cracked black pepper, you'll savor a splash of citrus zest from lemon peel and lemon salt, that ignites the taste buds, the spice blend provides a gentle heat that works equally well with milder and stronger seafood dishes. Lemon-Pepper is a fan favorite for that fresh, brisk, vibrant aroma as well as that delicious taste, that assures you and your guests of a pleasant, refreshing aftertaste. Lemon-Pepper make eating fun! This classic combination of lemon and black pepper is especially delicious on fish, shrimp and other seafood. Lemon-Pepper gives chicken and fish a subtle flavor boost, just enough to bring out their natural aromas and distinctive taste. However, our Lemon-Pepper is very versatile and can be used as a spice rub for grilled meats (particularly poultry) or a zesty topping for pasta or salad. Best spice possible for scrambled eggs and omelettes, and crispy lemon-pepper wings with crunchy fries. A must for salmon, catfish, flounder, or pecan-crusted grouper (red snapper as well, or any firm-fleshed fish). Great for turkey or duck breast, hamburgers, pork roast, chops or cutlets and all cuts of veal (especially stuffed, baked veal breast). Use it to sautée vegetables or mix with marinades, sauces, and dressings. Add it to butter for an easy flavored butter to add in pasta dishes and sauces. Flavor a stir-fry, try it with fruit or ice cream! The distinctive scent gets much better when you cook with it. A hand mixed formula of granulated Lemon peel, cracked extra bold Tellicherry Black Pepper, minced dehydrated Onion, pristine Himalayan Pink crystal sea Salt (Gourmet food grade), dehydrated organic Garlic, and 100% pure Citric acid (Lemon salt). Try this fantastic snack idea → spray some pita bread with a fruity Saratoga extra-virgin olive oil, sprinkle over the Lemon-Pepper seasoning and bake in a moderate oven for 8-10 mins. Cut the pita bread into slices. Great to eat on their own or with dips. Substitute Lemon-Pepper Seasoning for black pepper anywhere you want a bold, zesty flavor. Mix 1 to 2 Tbsp. Lemon-Pepper Seasoning into 1 cup sour cream or yogurt for a tangy dip. For mouthwatering chicken, let your bird pieces soak in a mixture of 1 cup buttermilk to 2 Tbsp. Lemon-Pepper Seasoning for a couple of hours before cooking. For a bright vinaigrette, whisk 2 tsp. Lemon-Pepper Seasoning with 2 Tbsp. Saratoga balsamic-vinegar and ⅓ cup varietal Saratoga Olive Oil of choice. For a citrus-inspired marinade, mix 1 to 2 Tbsp. Lemon-Pepper Seasoning with ¼ cup each orange juice, apple cider vinegar/balsamic, and Saratoga Extra-Virgin Olive Oil. Gluten-Free, No MSG, Non-Dairy, Non-GMO, Kosher, Zero additives. Tellicherry Black Pepper imported from Western India, Himalayan Pink Salt from Punjab region of Pakistan. Lemon peel, minced white Onion, organic Garlic and Citric acid from California.